Manchester United legend Gary Neville criticised Romelu Lukaku for missing a great chance in the first half against Tottenham in tonight’s Premier League defeat. 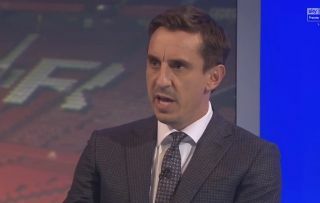 Neville, speaking on punditry duty for Sky Sports, conceded it was a slightly harder chance than it looked due to being on his weaker foot, but he also says there’s no excuse for a player of his calibre to be missing an opportunity like that. The Belgium international is undoubtedly one of Europe’s top centre-forwards and has scored harder goals than that in his career, but he made a big mess of things after being put through by a poor pass from Danny Rose. With the score at 0-0 at the time, it proved costly as Tottenham ran rampant in the second half at Old Trafford, with goals from Harry Kane and Lucas Moura bringing a 3-0 victory for the visitors. Neville feels, therefore, that Lukaku’s miss at that crucial moment could have been something of a turning point, suggesting Tottenham may well have crumbled if they’d gone a goal down at that stage. ‘It’s right foot, bending away from goal, [Toby] Alderweireld is coming back so it wasn’t as easy as it looks,’ the former United star is quoted in the Metro. ‘If you look at it there, it looks simple. But at full speed… look, he should score. ‘There’s no defence for a player of his quality. He should score and it’s a big moment in the game.